Doris Partel-Niederreiter has been managing director of Raiffeisen Informatik GmbH since 2017 and runs Finance & Controlling, Corporate Services, Organisational Development, and Change Management, together with participation management of the subsidiaries of R-IT. After graduating in business informatics at the Technical University of Vienna (TU), she gained valuable experience as a freelance IT-Consultant, and in IT-Competency and finance management, while working after 1994 for numerous large and small businesses such as Siemens, Horizonte Venture Mgmt and Salomed. The new millennium saw her bringing her profitable expertise to Raiffeisen Bank International (RBI), and she was subsequently taken on board as head of the technical project management of RBI. Shortly after, Partel-Niederreiter assumed the management of the CIO Office of RBI. Born in Salzburg, she was responsible for the IT-Governance & Organisation of RBI until 2015, when she became an integral part of the management of Raiffeisen Informatik. Michael Linhart was appointed to the role of managing director in 2017 and is responsible for Security, Audit & Risk Management, IT Architecture, Communication, Corporate Identity and project management, both for the IT operation, and for the clients of RBI & Uniqua. Linhart commenced his career in 1991 in software development and subsequently as a system engineer at Raiffeisen Zentralbank (RZB), where he assumed control of Network, Telephony and Network Security. As early as 2010, Linhart oversaw the division of the IT-infrastructure of Raiffeisen Bank International (RBI) and thereafter took responsibility for IT-Outsourcing as a project manager. In 2016 he became CTO of the RBI group and since then he has been in charge of strategic orientation, technical infrastructure and the entire innovative strength of the RBI group. Andreas Rosskopf, managing director of Raiffeisen Informatik since 2015, is responsible for the following sectors: Application, Infrastructure and License Management , as well as Service Delivery for all Raiffeisen banks. Furthermore, Rosskopf is a council member for the subsidiaries Raiffeisen Informatik Technical Services (RI-S) and BAT. He began his career in 1986 in Raiffeisenlandesbank Niederösterreich-Vienna as a product- and project manager. Since the new millennium, Rosskopf has concentrated solely on the field of IT-banking and on overseeing e-business in the e-force of the Raiffeisen group. Born in Lower Austria, he served on the extended management board of Raiffeisen Software Solutions und Service GmbH until 2012, when he switched to Raiffeisen Informatik as an Operation Manager of the CEO 2013. It was not just the moon landing that took place in 1969; that year also witnessed the foundation of ‘Raiffeisen Rechenzentrum’ (RRZ). With a staff of just two employees at the outset, the newly founded enterprise’s ambition was to be the best technological companion in all IT-concerns to its clients. As early as 1972, RRZ assumed control of investment accounting for Raiffeisenkasse and developed programs for EDI accounting. Modernization proceeded apace – already in 1979 in Retz accounting was switched to a computer based system in the bank’s 1000th location, and in 1986 the first foyer ATM was installed. Due to constantly increasing data volumes, a second location was introduced to further improve reliability. The business expanded solidly in every respect and in 2001 began to offer its services to the IT industry. Its greatest achievement was the development and operation of the Austrian truck toll system, which was awarded numerous prizes, for instance the state award. By 2008 Raiffeisen Informatik was operational in 30 countries worldwide, as a result of a successful participation strategy. Due to the financial crisis, the enterprise shifted back to its origins: data center services for banks and insurances. 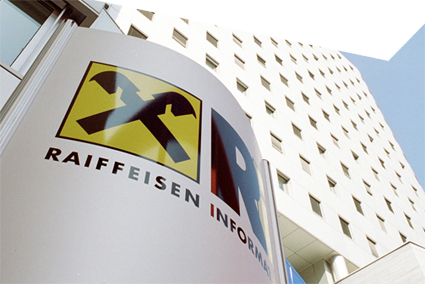 Raiffeisen Informatik belongs primarily to Raiffeisen Landesbank Niederösterreich-Wien AG, which owns 47.35 %, and RZB Invest Holding, which owns 46.95 %. Further companies such as RLB Burgenland Waren- und Revisionsverband, UNIQA Insurances Group AG, RBI AG, Raiffeisen Bausparkasse GmbH, Raiffeisenlandesbank Steiermark AG hold minority interests of between 1% and 0.10 %.